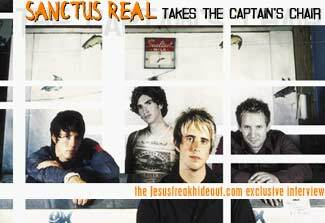 Jesus freak Hideout: Why the name "Sanctus Real?" Matt Hammitt: *laughs* Our drummer's responsible for that. We pin it on him everytime. He was actually looking up another word in the dictionary and came across "sanctus" and he really liked the fact that it just meant "holy" - it's like a hymn of praise. He's like "Man, that's a cool idea." But we didn't realize the way it was pronounced, which is "säng(k)-tüs." So we're like, "ah, let's just say 'sang-tus'" And then we tacked "real" onto that. It's something that our guitar player who we had for the first few months wanted to do and it means just being real - just relating to kids. And being up front and not trying to put on a face or an image and just being who we are. Matt: Actually, Steve here is the only non-totally original member, but he's been with us for about three and a half years. The other three of us started with another bass player in high school in November, 1996. We actually started out playing at our high school chapel services because we went to a Christian school. We began practicing on weekends and started playing out - played our first show in December '96 and ever since then just loved playing, played every weekend. We just kept on growing and growing and here we are six and a half years later! JFH: How old are you guys? JFH: When did you guys graduate from high school? Matt: Me and Chris '98, and Mark in '96. JFH: So how did you guys get signed to Sparrow? Steve: Well Mark and Chris took our independent record that you guys had, our Nothing To Lose record and they just filled up their backpacks and just went to GMA, passing it out to anyone who looked important. And the funny thing is they never officially handed it to anybody at Sparrow, they just got it through the grape vine somehow. And about two weeks maybe after they got back, we got a call and just started a relationship there and over a period of about eight months just courting a relationship and getting to know them and praying on our side, we just felt like that is where we were supposed to be. Felt like it was so we signed the deal. We actually signed the day we started recording. Matt: Like officially signed. We had kind of like a verbal committment. JfH: So you were in negotiations for like a year before the album actually came out? Almost. The negotiations took roughly 6 to 8 months. Matt: A lot of different rock acts, y'know. As a singer, I have some different pop influences. When I grew up I used to really enjoy a lot of the pop music of the 80's and I think that kind of planted those melodies in me for life. But as I grew up I started kinda finding my own music. I got into some early Christian bands like johnny Q. public, Violet Burning, Sixpence when they first came out. A lot of different bands -- I really dug what Steve Taylor was doing and just rock, y'know? That just really started influencing me. Our guitar player Chris, who isn't here, he was really into classic rock. His dad was always into classic rock so he listened to anything from starting with the Beatles up until like Hendrix, Clapton, Cream, Petty and all these different artists. He was really into that so it kinda made a cool fusion of the pop side of things and the riff side of things. Steve: I personally am a big Switchfoot fan, love the Foo Fighters. Matt: Weezer. (Steve agrees: "Weeze is a given.") Weezer is like the big inspiration band for us musically. Steve: U2. Mark our drummer wasn't saved until he was sixteen so he liked Led Zeppelin, Black Sabbath... (Matt chimes in with a deep voice: "White Snake") Yeah. *Matt laughs* He got into the 80's "hair bands." (Matt: "Big time! ...Cinderella...") It shows up a little bit in his drummer, but it's pretty cool. JFH: On Say It Loud, you guys got to work with Pete Stewart. How did that come about and what was it like? Steve: It was fun to work with a guy who was real "rock"-minded. It was cool also having that mentality and being so laid back at the same time. Because I think even vocally for Matt and each area that we play, he really drew out our best performances. We actually did the record in two halves. He really challenged me on the first half of the record and I learned a lot. When I came back to do the second half, I could tell there was an improvement, he could tell, and it was really cool to be able to walk away and feel like not only have I played on the record, but it's a great record in my opinion. I feel like I actually improved musically. It was really neat, he was just really awesome to work with. He was really super... super laid back. *laughs* One time - y'know, being a rock guy who wouldn't start till like noon everyday. We'd get there -- and he's a super Starbuck's fanatic -- and we'd work like forty five minutes and he'd be like "Alright, time for a break." We're like "What?! We haven't even done anything!" He's like "I gotta get some coffee." *laughs* He's a really cool guy. JFH: Who's the kid on the cover of Say It Loud and what's with the alumninum foil? Matt: *laughs* Absolutely no clue. It's something that our designer at Sparrow found on the internet and he loved it and licensed the picture for our CD cover. And when he brought the different CD covers to us as options, everybody picked that one. *laughs* We just thought it was hilarious. There's really not much meaning to that, it's just funny. Everybody was like, "Ah, that's hilarious! We love that one!" Steve: The picture was probably taken before any of us were born. Matt: We don't know, it looks so old! JFH: What is the story behind "Captain's Chair?" Matt: "Captain's Chair" is a song that Chris kinda brought to the table about a friend who went through a really rough time in his life and it was strange for all of us. We were his best friend and through kind of a relationship gone sour he put on a face to us and really ended up hurting us a lot. There were some things involved that were really shady and we didn't understand why we were treated the way we were. We had our thing going, he had his thing going. And you know how you just know somebody so well, but then you [realize you] just don't know them, y'know? And that's what the song's about, "Where did you go / How have you been?... but we'll be right here," so whenever you need us... That was the whole point of the song. And we don't want people to think it's a crock for any of our songs, but we really try to relate everything to the Lord and our relationship with God. So when we wrote that part, "you will take the driver's seat and I will take the captain's chair," the initial, earthly meaning of that was... it's weird. (Steve: "It's kind of a long story") It's a long story. Chris loved to drive the van. Our old friend used to love to come out on the road and drive the van, too. And he would always joke around about who was going to drive. Y'know, "Here, you'll take the driver's seat and I'll take the captain's chair." It was just kinda like an endearing thing. But it was also cool cause we were like "Man, that's what we gotta Spiritually too in these situations. We gotta give it over to God. We can't take this." That's kinda like the main idea of the song. You just gotta give it over, you gotta let it go. You just gotta let God do what He's gonna do. And everything is gonna have to work out from there. (Steve: "'Cause that's hard to answer!") *laughs* Yeah, it's hard, it's a long story! JFH: What inspired "I Love You?" Matt: I really struggle as an artist, and I think a lot of artists do, with criticism. We like to criticize music and we really like to analyze everything and we think we're so smart all the time and we're just not, y'know? It's so relative to what's good and what's not good and it's so just an opinion, but we all think we're right. One day God just tugged at me and He said, "You know what? You don't know anything." You know what I mean? Cause it's all about the heart. That's all that matters is the heart. Can we look past all those cliches that we see in every song and think that it's not artistic or creative enough and just be inspired to go write another song. It's kinda just like me trying to humble myself and I'm just gonna write a song that says something that's simple and it's unartistic as "I love you." Cause you've heard it a million times. That's the whole point, it's nothing new. Can we still see the beauty in such a simple term instead of trying to be so poetic all of the time. Because all that matters is it's coming from our heart. JfH's John: Yeah, cause I can totally relate with having to review CD's all of the time. Yeah, totally man. Like even though we may cringe at the sound of something, God can still take it and use it. JFH: What about the song "After Today?" Matt: Oh man. That's a song that I wrote right around the time I was graduating high school. Actually, I always think it's after I graduated high school, but I think it's during my Senior year that I wrote that song. It's just one of the things where I was kinda confused coming out of high school as to whether or not I was gonna go to college. And y'know, everybody tells you're supposed to go to college after you graduate. But I knew that I wasn't at the point with the band where I could go full time or I couldn't foresee us being mature enough in our songwriting and musicianship to make a career out of it yet. But I could just see a vision for it. And I just knew that God was calling me to do this and I was just going to be able to do it one of these days. I wrote that song in such confusion, not understand what I should or shouldn't do in life. And I didn't understand the circumstances that surrounded me. OK, here I am, I feel kinda alone, I feel like I can't really see the road ahead of me, but I can praise God cause He's got a plan even though I don't understand it. And you just have to trust that. That's what faith is, y'know? You can't see it, but you believe in it and you believe that God has it. I always try to challenge students that no matter how you feel, whether it's at the top of a mountain or the lowest part of the valley, that God has a very very unique play for everyone's life. And you can't afford to miss it. People miss out on it and they end up ruining their lives, because they don't believe God has a plan. So I hate to see kids do that. That song will hopefully inspire students to say, "Man, y'know what? I don't understand but I'm gonna keep pressing through and I'm gonna go for what I know is right." Steve: Playing in the band, also, there's times when you're aggravated beyond belief with situations that are going on -- whether it's personal, whether it's band-related, whether it's vehicle-related, y'know. But no matter what it is and you get on the stage and you're kind of copping an attitude whether it's two people or you're just being stupid. And there's been times when I'm playing and you know the routine and you know the song you're playing and all of a sudden that part comes up, God's got a plan, understanding isn't my place, and I'll be singing it all of a sudden I stop and I'm just thinking "Oh man, I just gotta shut up cause I don't understand why I'm going through this but God does!" If there's even one thing I've learned that that song reminds me that God one hundred percent of the time is always faithful and His plan is always perfect if we allow Him to fulfill it through His will and His timing and we don't force an issue. He (Matt) wrote it to kids, but coming into the band later it seems like every time I play that song it kinda slaps me in the face in a good way of kinda waking me up saying "Alright man, live what you preach!" *laughs* You have to. JFH: What's the story behind the hidden track on the CD? Matt: *laughs* That's Mark and I's ode to Stryper, pretty much. *laughs* I was really into Michael Sweet when he came out with his solo projects. Mark was a couple years ahead of me, so he was so into Stryper but I just kind of picked up at the Michael Sweet end of it, y'know? And I was also into bands like Guardian and Bride when they came out. John: *laughs* We were totally into them too, around like the mid-nineties! Yup! Totally, man. (Steve: "Like Holy Soldier...") Oh yeah! Yeah, it's just a chorus I came up with, this dumb chorus, and we went over it and Mark was like "Aww that's rad! Let's go over it!" And he help me tweak a couple words here and there. Before you know it, Pete heard it just as a joke. He's like "We gotta record this man!!" (Steve: "Yeah, it was no option. He said it will be on the record.") Pete was diehard. Pete was like "This is amazing, this is gonna be full-on rock, and it's gonna sound authentic and we're gonna make this happen." That's the story behind it. JFH: Festival Con Dios last Fall was your first big tour. How was your experience with that? Any highlights? Matt: It was amazing. We had some really bad weather. Half the tour was terrible weather-wise and it was all outdoors so with the rain and winds... it was awful. But on an internal side thing, you could have forgotten all the shows and all the bad weather, but the unity that we had amongst all the band members in the bands was amazing. And the support that we got from all those bands, stuff being on the road, spiritually, and just friendship-wise, really encouraged us. I think it was the best tour we could have been on. And we made so many friends and we realized this is a family and it's a ministry and everybody was just stepping up to the plate and taking good care of each other. And even Toby [McKeehan] said at the end of the tour, "I have been so impressed, with being in this so long, I have been so impressed with this tour. This just proves to me that are still a lot of good people in Christian music." And that really meant a lot to us that he would say that to everybody. We felt the same way. It was a great tour. And it was good, too, exposure-wise for us. That was the best part. JFH: What was your most embarrassing on-stage moment? Steve: *looks at Matt* I know yours. It was before I was in the band. (Matt: "What is it?") Your little "head stunt." Matt: Oh yeah! I played this show in Michigan where it was all dark and there was smoke in the room and there was a concrete ceiling. And I jump on the drum riser - and the ceiling dipped down right above the drum riser and I didn't even know it (Steve: "It was painted black"). It was painted black, I couldn't see anything - so I decided I would do this huge rock n' roll jump, right? I squat down at the end of the song and I jump and at about a foot and a half I just stop and I fall to the ground. As I'm falling I can just see everybody covering their mouths going (in an imitative voice) "Ohhhh!" I kinda land and after about 4 of 5 seconds I reach up and feel my head and there's blood all over my hand. I had cracked open my head on this concrete wall. And it wasn't bad but it was just shocking, y'know what I mean? I was able to finish the show but I was just dizzy. I probably had some sort of mild concussion. I probably shouldn't have finished but I did. *laughs* And I was fine but yeah, that was embarrassing cause what do you do after that? "Hey everybody! Uh... haha... Well forget about that, let's keep going!" Steve: We played a show in Colorado - we had never played in Colorado before. I grew up there so I was somewhat used to the altitude. Well, we had never played there before altogether. *laughs* We were playing at my Dad's church, actually while on Con Dios it was just a really quick spot date cause we had some time off. So we're up there and we're rocking out. Well they live in the mountains so we're like 10,000 feet, 11,000 feet and we're rockin' hard. Well y'know, the air's thin, we're dying. And Matt gets up there and he's dizzy, out of breath and he's like, "I have never been this high before in my entire life." *unanimous laughter* Everybody's like *impersonates the wide-eyed spectators* staring with big eyes. [Matt's] like, "That didn't sound good did it?" But it was awesome! Matt: I was just like, "I'm so sorry. I mean altitude high!" *laughter* Those kind of things you try to cover up and you just dig yourself deeper. It was bad! Steve: Probably one of mine was I used to get a little too into the music and not pay attention to what I was doing on the bass or around the stage or whatever. And one night, we're playing at this small little youth group and I was just going crazy. And I didn't realize it but my cord was wrapped around my leg and I went to do this big rock n' roll kick and my pedals just launched across the room. I had unplugged everything in the middle of the song and I had to walk across the stage and pick all my stuff up and Chris and just everybody was dying. That was pretty embarrassing. You're trying to be cool and you end up looking like a loser. JFH: Favorite things to do on the road when you're not performing? Matt: I like to sight-see whenever I can and I know Steve does too. We like to go see things as much as possible. Anything that's adventurous like riding motorcycles or uh... *laughs* uh... (Steve: "I'm sure we'll experience more...") Yeah, exactly! Going and finding new places. Going surfing. Steve and I love to try to go surfing. (Steve: "We're kinda the outdoor bugs in the band.") Whatever we can find. It's so hard when you're on the road because you don't have stationary things to indulge yourself with like hobbies. You kinda have to just find what's there. Steve: I've been reading off and on some different books and stuff. That kinda kills the time. Lately I've been realizing the toll that touring takes on your body so I bought some weights. I figured I am just sitting here so I might as well lift weights. (Matt: "It's about once a month Steve does some curls." *laughter*) I just got them so I'm starting to get into my routine. JFH: How does it feel getting all of this new-found attention with the release of Say It Loud after being independent for so long? And is it easy to let it go to your head? If so, what do you do to keep your feet and mind grounded? Matt: Have we been getting attention? (Steve: "Yeah?!") *hearty laugh* It's really funny because people always ask us that, like "Man, how does it feel to be getting so much attention so fast?" And we don't feel like we've gotten any attention. *laughs* John: Really?! Yeah! It's because when you're on the inside of it and you're so busy you just lose contact with what's going on. It's just really hard to know what's going on. And even if you hear it, it's hard to believe it. It is cool though to come to a concert on a national level and see kids singing our songs. It just freaks us out. So I think we're more humbled at this point than we are getting big heads over it. It really is humbling to know that people appreciate what we're doing. I think if we can keep that perspective we'll be alright. John: Does it feel weird cause you guys were around for awhile before? Yeah it is. We've been doing it for so long that it's hard to let it go to your head. Cause we still face trials, y'know? We're still paying our dues. We're at that point now where it's like we're still struggling to get to where we need to be -- even financially, and to pay our bills still. It's hard. In the midst of all that, it's hard also to think or feel as though things are really going for you. But we're thankful for every opportunity we've got. JFH: What do you see for the future of Sanctus? Are you guys already planning another record? Matt: Yeah, it's been mentioned to maybe work on another record in the Fall or early next Winter. We're not sure yet if that's going to happen. We're still trying to figure out what's going on in terms of touring in the Fall as well. Long term goals? Man, I just think maximum exposure. We just want more and more people to hear what we have to say. Not necessarily what we have to say because we're great, but hear what we have to say because God's done some cool things in our lives. For us not to be able to share that would be a shame. So who knows where that'll take us. We have goals but we don't have expectations. We've kinda been surprised thus far by some of the success we've had. And I think we'll keep on just being surprised because we don't really expect big things but we hope them. Matt: Man that's rough! (Steve: "Gee whiz...") I just hate these ones. Cause you might say a movie that there might be like one part in it that may be questionable and then somebody might be like "Aw, he watches that movie!" Y'know? Like my favorite movie has got to be -- that has come out in the last several years -- Zoolander. (Steve: "I know what my favorite movies is...") It's one of those things where you watch it the first time and you chuckle and the more you watch it, you're just rolling. The more you watch it, the better it is. It really has some dry humor in it and it's so creative that you pick up on something new every time. It's just hilarious. Steve: I'm, hands down, for right now and quite awhile - Lord of the Rings. (Matt: "Aw dude, that's great.") I saw the first one, I bought it, watched it a million times, saw the second one and I think it's better. (Matt: "Not nearly as funny as Zoolander but definitely better!") A little more intense! (Matt: "Yeah, that's gotta be one of the best movies of all time.") Chris' is Back to the Future probably. JFH: What's your favorite food while you're on the road? Matt: It's gotta be In N Out Burger for me, man. We say it every interview, but it is. It's the best. In California - In N Out Burger. It's the best burger and fries you'll ever have. It's all made fresh. Steve: It's really cool cause it's Christian-owned. That's the really neat deal but they're not a big chain because they won't freeze their meat. So they'll only take it as far as it will go without spoiling so they can cook it fresh. And they make their fries from peanut oil. (Matt: "It's a lot healthier.") Their shakes are really good. Matt: And it's a small menu, it's literally like burgers, fries, and shakes. Or if you're local you can order grilled cheese if you want. It's really cool cause they have local menu items too. 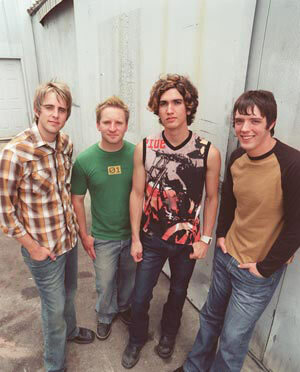 JFH: Do you have a favorite Christian band? Steve: Switchfoot, hands down, awesome. Then Delirious. Matt: Violet Burning. Michael Pritzl. Matt: Keep it real! *laughs* Keep God first in your life and everything will work out. That's all I gotta say!